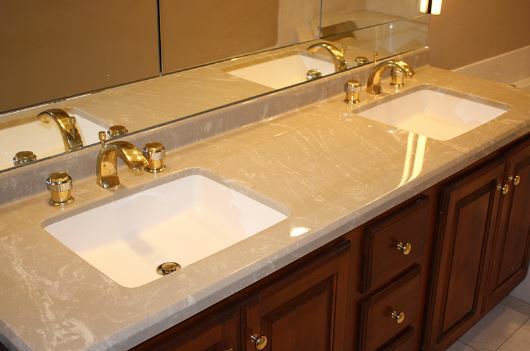 Custom Vanity Tops are the easiest way to improve the look of your bathroom as well as the durability and usable area. When it comes to vanities, there are a tonne of options from various price points and can become overwhelming pretty easily. Fortunately, Beckworth LLC will help you with your bathroom options to make the best selections for your budget and taste. When choosing custom vanity tops you will need to consider the dimensions of your cabinets and counter area before selecting the wood and top materials. If you want to have a sleek veneer surface with modern cabinets then you may want to choose granite or marble. Quartz is another option that offers a beautiful solid finish with low maintenance and higher resale value. Laminate, Tile and Wood are other options you can consider if you have a more limited budget or care more about durability and usefulness over the looks. Laminate is cheap and very durable but not very attractive. Tile is more durable and costly but takes longer to complete. Wood is a great option but has a lot of maintenance involved. Granite and Ceramic are other options. With so many materials available, it can be difficult to decide what type of vanity countertops to consider for your home. We will help you choose the best materials for your bathroom and budget. We will also take the time and options personally to deliver the results you want within time estimates and below budget if we can find you a good deal. When it comes to custom vanity tops we have you covered to get the best design and dimensions you want for a better bathroom experience at home. Your family and investment are in good hands with Beckworth LLC, call us today at (703) 570-6777 to schedule a free in-home estimate or, or use our contact form.